Roger Kellaway, Live at the Jazz Standard (IPO). For the pianist’s stand at the New York club, he continues his drumerless ways of recent years but, as usual, has plenty of rhythm. He is abetted by guitarist Russell Malone and bassist Jay Leonhart. Vibraharpist Stefon Harris is also aboard, fitting into Kellway’s conception of a group modeled on the Nat Cole Trio. Cellist Borislav Strulev makes a moving contribution to Kellaway’s “All My Life.” The exuberant blowing is on familiar pieces, from “Cottontail” to “Freddie Freeloader” and “Take Five.” Unmitigated swing is the rule in this beautifully recorded live date. 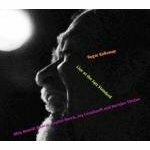 ROGER KELLAWAY—there is no other jazz or any other genre of music that anyone does better than Roger. He is a gentleman, and when he sits at his piano pure magic happens. I am so proud to call him my friend. I look forward to seeing him and his trio again in Washington. I had the honor of seeing him at the Jazz Standard and he just blew me away. Go get ’em Roger. I love you lots.